Beirut (AFP) – At least 11 civilians were killed in Syria’s second city Aleppo, a monitor said Sunday, in one of the highest single tolls since a fragile truce came into force. Nearly all warring parties in Syria — the regime, rebels, jihadists, and Kurds — have carved out zones of control in the war-torn northern province. According to the Syrian Observatory for Human Rights, six civilians were killed and eight wounded in regime air strikes on rebel-held eastern parts of Aleppo city on Saturday. Opposition groups fired rockets into the government-controlled western districts, leaving five people dead and 20 wounded, the Observatory added. “There’s a clear escalation. 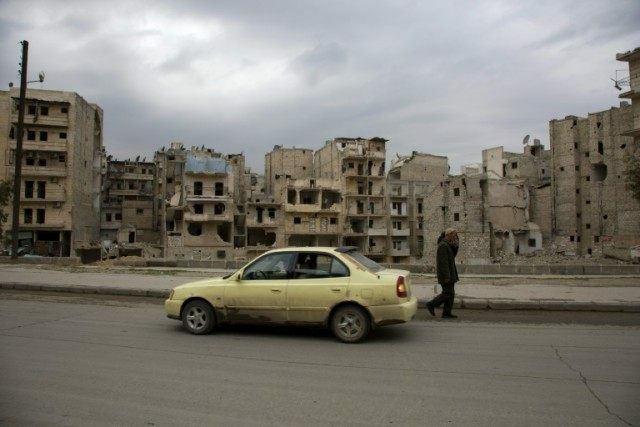 This was the bloodiest incident in Aleppo and its province” since a truce deal between the government and non-jihadist rebels came into effect on February 27, said Observatory head Rami Abdel Rahman. Brokered by Russia and the United States, the cessation of hostilities deal does not include the fight against the Islamic State group or Al-Qaeda’s local Syrian affiliate. The truce had largely held across parts of Syria since late February, despite frequent accusations that both sides were committing breaches. But violence around Aleppo has sparked concerns that the ceasefire may not last, partly because rebels are involved in the battles there too.